Welcome to the May Carter Pottery Studio! 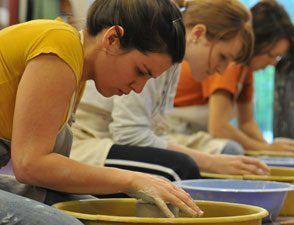 Join us for our excellent instruction in the May Carter Pottery Studio. 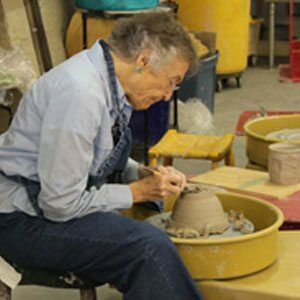 The studio continues the pottery program which started years ago at the old Fine Arts Center, but finally in a studio that was designed for clay! 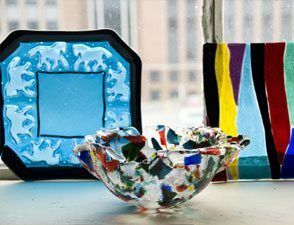 And not only clay, there are also classes in jewelry, kiln fired glass, stained glass and mosaics. Fine crafts have a home in Lynchburg! Classes are offered throughout the year for all ages, with an emphasis on young people’s classes in the summer. Equipment includes nine electric potter’s wheels, a slab roller, two extruders, a clay mixer/pugger for reprocessing clay and large tables for hand work. There is amble built in shelving and rolling carts for work in process. Kilns include a custom Bailey Gas Kiln and two automated electric kilns. We custom mix our glazes, stock Highwater Clays, and offer a range of firing possibilities from low temperature earthenware to cone 10 reduction. Adult classes meet weekly for usually eight week sessions meeting 2 1/2 hours a week. All levels are offered from beginner to advanced. Special topic workshops and guest artist instructors take place yearly. For a small additional fee open studio time is offered for students enrolled in classes. There is a dedicated programmable kiln for kiln fired glass. Special fusible glass can be fused , cast and slumped, creating unique flat and dimensional work. We keep a stock of fusible and stained glass for classes and extra glass may be purchased for special projects. Other equipment includes a ring saw, grinders as well as handcutters and breaking and grozing pliers. This equipment is used in stained glass as well. Large sturdy tables provide a good working area for glass.